Avoid confusion and let customers know exactly when you’ll return with the “We Will Return” Clock. On one side, a manually set clock notifies customers when you plan on returning. On the other side, the sign lets customers know that you’re open and ready for business. The sign measures 6 ¾ "H x 5 ¾ "W and easily attaches to any window via suction cup. This will return clock is great for our business. It is bright and colorful and can be seen from a long distance. I like that It is plastic coated so that it can be used in bad weather. This is an adorable sign, but I was hoping it would be about 1/2 the price. The suction cup works! I have always had trouble with them but with this one it worked first try and has not fallen once. The product itself is great and the price is awesome. My suction cup want included but the price is so good that it's ok. This is large enough to be seen easily. Sturdy. Item was shipped very quickly and in great brand new condition. Very nice quality and really helped my business. I have been using Store Supply Warehouse to purchase all the supplies for my brand new store. I have not been able to find better prices or faster delivery without compromising quality. I will be a customer for a very long time. This is the fastest I've ever gotten a package from a vender. Incredible!Putting in another order now! Thanks for great service!! Good size and very easy to use. I put it on immediately. 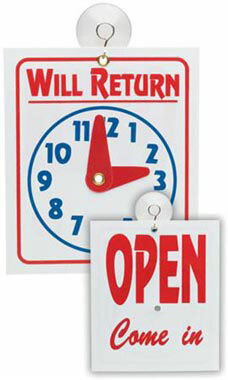 This sign does exactly what it says it will do..inform customers and street wanderers if you are a) "OPEN" (one side is devoted to this) b) when you "WILL RETURN" WITH A CLOCK. There's no 2nd guessing. Your guess will know if you are open or when you will get back.